Daily KO's - The recorded impact of the Gulf of Mexico oil spill on wildlife may have severely underestimated the number of deaths of whales and dolphins, according to a new report. An unusual mortality event has been declared by NOAAfor cetaceans in the northern Gulf of Mexico. However, the actual number of dead cetaceans may be 50 times higher than the number counted according to a new study published today. 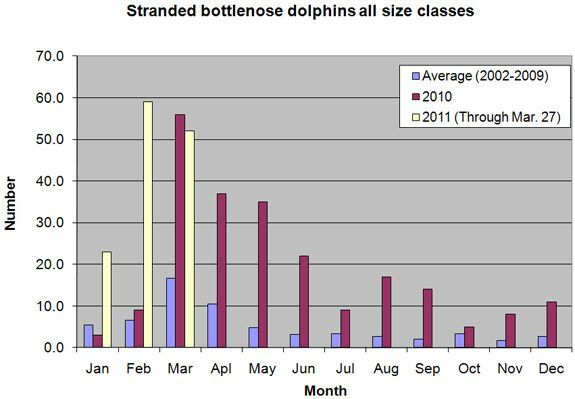 Cetacean mortality tabulated by NOAA based on observed strandings. "All stranded cetaceans (dolphins and whales) from Franklin County, FL to the Texas/ Louisiana border." All stranded bottlenose dolphins from Franklin County, FL to the Texas/ Louisiana border. A marine mammal advocate working for the NRDC calculates that thousands of dolphins have died.